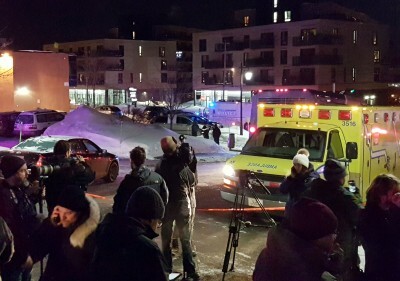 The tragic Jan. 30th attack on worshippers at a Quebec City mosque has gripped all of Canada. Thousands of decent Canadians, from all walks of life, have taken it upon themselves to demonstrate their outrage at this heinous crime, and to show solidarity with muslim Canadians. We congratulate the organizers of the well-attended and quickly-organized Hamilton demonstration, and hope that we can work together as a community to end the islamophobia that led to the criminal attack in Quebec. The military interventions, waged by George Bush Sr., Bill Clinton, Bush Jr. and Obama in predominantly muslim countries such as Iraq, Afghanistan, Libya, Lebanon, Somalia, Sudan, Yemen, and Syria have all required the demonization of entire governments, and by extension, the peoples of those countries. Some U.S. and Canadian political figures and commentators who helped to destabilize entire regions (the Middle East and North Africa), have at the same time cynically capitalized on the resulting violence and refugee crises by raising fears about an entire religion, namely, Islam. It’s time to recognize that successive Canadian governments and the corporate media apparatus have consistently promoted war and violence as an acceptable tool for remaking whole regions. It is in these conditions that ‘lone-wolf’ attacks occur. The powerful state and corporate media, through their blanket slander of whole countries and religions, help to put hostile islamophobic ideas inside vulnerable minds. In a time where social stability and institutions are fraying apart, when the march of progress has seemingly ended, when people have nothing to look forward to other than war, cutbacks, and joblessness, misguided individuals will use the ideas that the powerful have handed them – that muslims are dangerous, that killing is acceptable, that violence will be rewarded – and try to turn them into practice. In doing so, they are following a template that has been created for them from above. It is possible to build a better world. First, we need to throw off the idea that the U.S., through NATO and various other bodies, should be managing the affairs of Europe, Africa or the Middle East. Those governments have to give up their ambition of empire. They need to respect international law and sovereignty. They have to recognize the principle of national self-determination and respect people’s democratic rights to determine their own country’s destinies. The abandonment of these concepts has led to a culture of lawlessness, violence, and impunity that we now see reflected in this tragic vigilante action in Quebec. If our governments act like gangsters, than our citizens will too. Canada can tag alongside the U.S. like the goons in a Mad Max movie, or it can follow an independent, peaceful, and humane foreign policy. In order to build a foreign policy that reflects the vision among many Canadians for a more just and peaceful world, many of our elected representatives will have to reawaken the concept of a “political opposition” to this war agenda. When will the opposition political parties in Canada take a stand against the war agenda? – develop an independent, peaceful, and humane Canadian foreign policy.